I spotted this interesting information about our blood type that highlights the health and nutrition information that corresponds to our exact biological profile. 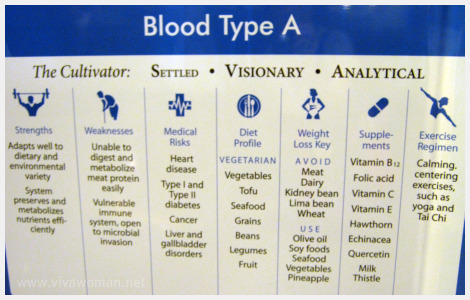 These look like roadmaps from Dr. Peter Dâ€™Adamo’s Eat Right For Your Type, which state that our blood type is the most important factor in determining a healthy diet and how a blood type diet can help with weight loss and even slow down our aging process. We’ve often been told to adopt a balanced diet but if Dr D’Adamo is right, then the balanced diet for each of us actually differs according to our blood type. People with type O blood fare best on intense physical exercise and animal proteins and less well on dairy products and grains. The leading reason for weight gain among Type O’s is the gluten found in wheat products and, to a lesser extent, lentils, corn, kidney beans, and cabbage. Ideal exercises for Type O’s include aerobics, martial arts, contact sports, and running. Those with blood type A, however, are more naturally suited to a vegetarian diet and foods that are fresh, pure, and organic as Type A’s are predisposed to heart disease, cancer, and diabetes due to their sensitive immune system. Type A’s prefer calming, centering exercise, such as yoga and tai chi. 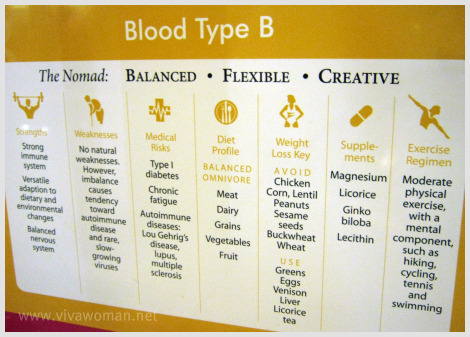 Type B’s have a strong immune system and a tolerant digestive system and tend to resist many of the severe chronic degenerative illnesses, or at least survive them better than the other blood types. Type B’s do best with moderate physical exercise requiring mental balance, such as hiking, cycling, tennis, and swimming. Blood type AB, the most recent, in terms of evolution, of the four groups and an amalgam of types A and B, is the most biologically complex. For this group, a combination of the exercises for types A and B works best. I’ve read of this information but haven’t followed the suggested diet for my blood type. However, I’ve recently heard my hairstylist talking about this and stating that he’s been feeling better since cutting down on meat intake because he’s a type A. Anyway, I thought this makes interesting read for those who are into inner health and beauty as we are what we eat. I’m a type B and it seems that a balanced diet works well for me. If you’re keen to find out more, check out Dr. Peter Dâ€™Adamo’s website, which has more detailed info on the various blood types. You may also like to know that he has designed a new cosmeceutical line called Dâ€™Adamo Genoma Skin Care that specifically combat and remove (Advanced Glycation End-products) AGE molecules. So tell me, what’s your blood type? The shop at Parkway Parade (basement) seems to sell some of the books and also supplements if I’m not wrong. I was busy taking the pictures and I didn’t look carefully. You have a weak digestive tract? I guess the profiles are not completely accurate for all. I believe I have some weakness but it stated none. i’m a type O and i’m terribly prone to digestive system problems! i am a really big meat eater though. So the health profile doesn’t exactly fit you too. 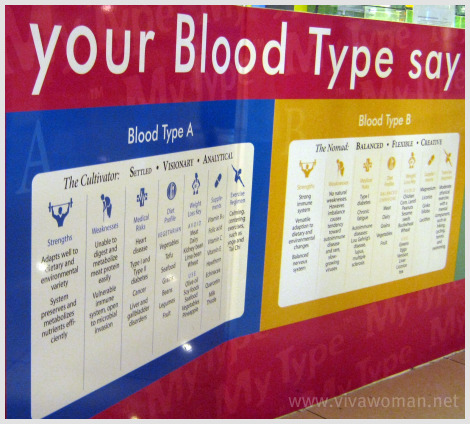 There’s a blood type restaurant at Raffles Place where they recommend/serve the type of meals that are suitable for your blood group, do check it out. PRetty interesting! I didn’t know about the blood type restaurant. Interesting! interesting. but i would not think blood type alone accounts for our biological profile. i’m type B too by the way. might consider some for the supplements reccommended. you? I’ll skip the supplements but I’m thinking if I should avoid chicken cos I really love chicken! I’ve been eating lots of it since a child. I am type O too but I love carbs. Although I try to have a balance diet nowadays. 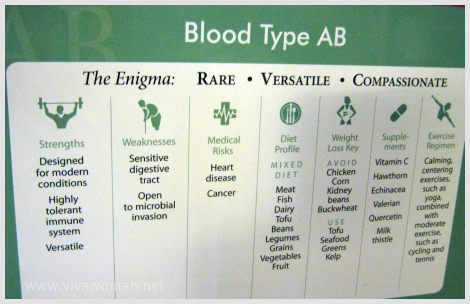 I’m type AB, personally I think factors affecting one’s health, nutrition needed and character traits are more complicated and blood type is probably one of the less significant factors, what do you think? Hmm…I’m not knowledgeable when it comes to the topic of health. But my impression is blood type would be more important. 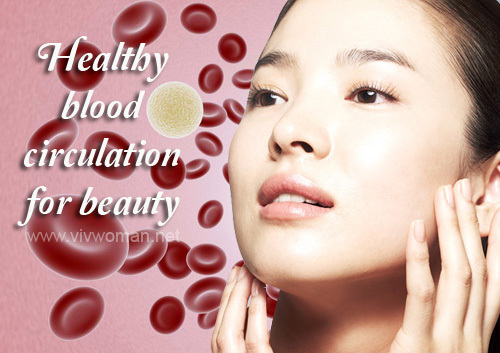 However, whether eating right according to our blood type is debatable. I can’t say it’ll work across the board cos there are probably other considerations. Oh! 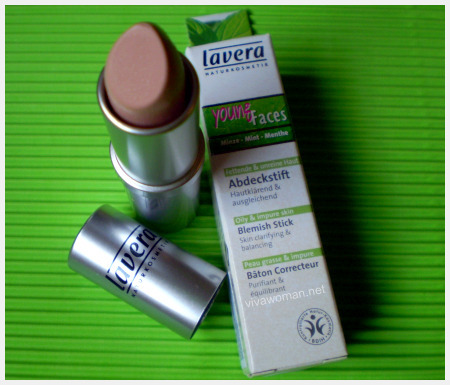 Do let us know if it works for you. What’s your blood type btw? I guess we can’t tell until we try some of the suggestions. But I certainly like the idea of being The Nomad! Oh, I am Type B but my stomach is kinda sensitive too! I should’ve really continued playing tennis. LOL. Thanks for sharing! I will check the website too. You’re a type B too? I get stomach problems too and I’m a type B. I guess it also depends on how we’ve been taking of ourselves and what we’ve been eating since we were young. Sure, I will:) My Blood type is AB+ and I am supposed to eat mixed diet from group A and B.
You’re have the same blood type as my son! Oh okie:) Does he like red meat? We rarely eat red meat these days. It’s mostly fish and chicken. 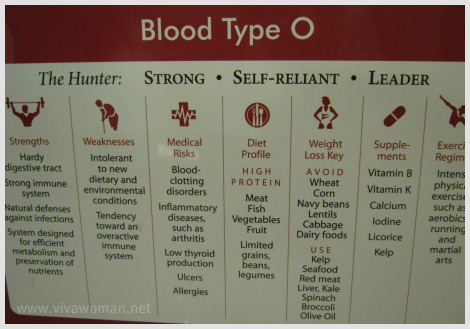 I’m type O and a vegetarian (natural born meat eater?). I don’t agree with almost all of what it says. The blood type diet is just another fad diet, oh well. Well, as with everything else, some pple will believe and some will not. I did read a lot of controversies on this one too. i’m type O. The activities are actually fit. I rather working out than doing yoga or swimming. And i also get rid of my few extra pound, it seems cuz of eating grain products. I do like dairy products, according to this info i should limit them i guess. Well, try to moderate…can’t say if this really works for all although some told me it does. I guess there are also other factors to consider. What about Rh negative? lol. It’s rare, but it’s out there. Haha…it’s apparently not in the research I think. Well, don’t be too upset Lindsey. This is just one view presented but it doesn’t mean what you’re doing is all wrong. The O blood type is the most common world wide and its the first one that developed. Blood type A is the second most common and the second one that developed. Blood type B and AB are the rarest, and AB is the last one that evolved. Im not sure if the blood type diet works, it probably does for some people but not necessarily everyone. Moderation and balance is key in life for everyone. Im European with a B blood type and I have noticed that I can tolerate dairy well, as well as some meats, but gluten doesn’t sit right with me if I have more than a small amount. So I guess there is some truth to the diet for some of us. It is interesting!